I originally wanted to take down my 75g and start a smaller tank to have my pistol shrimp and rock anemone live in.. But i just cannot afford it anymore. 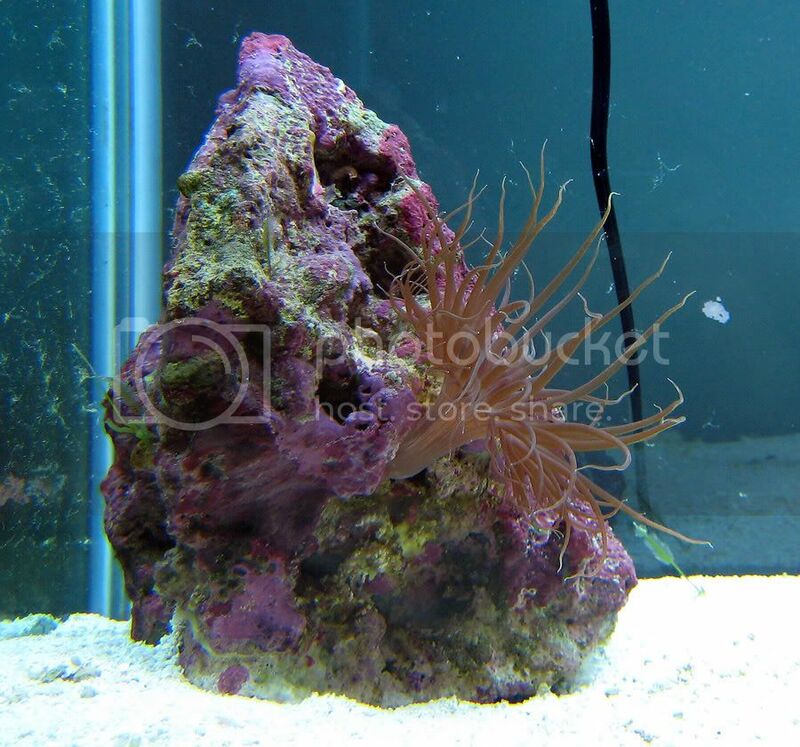 The pistol shrimp and rock anemone came on a liverock order from liverocks.com back in 2004. Now maybe i am wrong, and it is aiptasia, but it hasnt spread for 3 years so i highly doubt it. it's so much fun to watch it eat.. I snapped some pictures of it about a week ago in my almost bare 75g tank. However, the pistol shrimp didnt want his picture taken. but he is sandy brown in color with blue stripes on his back . i'll also have the 75g oceanic tank with some coraline and $300 tall oceanic stand forsale in near future. not sure what to sell it for yet. Last edited by elise on Tue Jan 29, 2008 11:28 pm, edited 1 time in total. It does look like aptasia, I have however heard of a strain of aptasia that dosnt spread in pest like proportions like most. 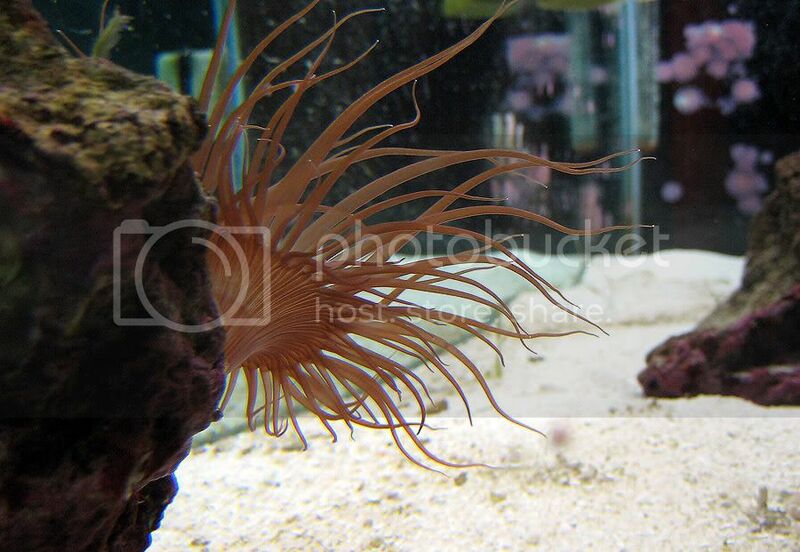 Still, its a neat looking nem. I am pretty sure its at least Aiptasia sp. though it certainly seems like its a different species than what we usually deal with. Nothing wrong with Aiptasia though, my first reef back in 1988 was full of it and I was just psyched that something had grown and reproduced in the tank at all. well whatever it is, its not spreading. no one is interested in the pistol shrimp!? i just want him to have a good home. elise wrote: no one is interested in the pistol shrimp!? i just want him to have a good home. sorry, I would have taken him in the past, but I have enough shrimp as it is in my 15g. I am sure someone will take him though, I know I really liked the one I had in the past! Do pistol shrimp bond with Yellow watchman gobies? middleton5 wrote: Do pistol shrimp bond with Yellow watchman gobies? Desy148 wrote: Hello! I'm not an expert in all this yet, but I'm interested in such questions. I esteem your opinions, I think it will come in handy.